Unlike conventional subwoofers, the frequency response remains flat at all output levels until the output limits have been reached. Without Direct Servo, a flat response will only be achieved at low output levels. A sealed box is recommended for DS1200ci. Those who would like the extra low frequency output of a vented box should choose our 15" DS1500ci. The driver has a higher excursion headroom and the risk of bottoming the driver is less. In a vented box, the extra output comes from the higher efficiency caused by the vent output. To achieve this higher efficiency, a larger box is required. Many believe that a 12" vented box will be "faster" than a 15" but this is not the case with our products. Contact us if you would like to consider an alternative alignment to sealed or vented box. We carefully select all components for performance and value. We have selected components that will return the best value. For instance, the MILLS current sensing resistors, the op amps, and the hand selected MOSFET inputs stage for power amplifiers. We don't cut corners. We also avoid wasting money on "audiophile" components which offer no real advantages. A lot of audiophiles like to run their front speakers full-range. The objective is to avoid any signal degradation on the front speakers. Our recommendation is to have a simple RC network as shown in the FAQ page to relieve the bass burden from the front speakers. In either case, a 24 dB low pass roll-off version of the subwoofer is recommended. Phase alignment is also very important. One can either use the phase control on the plate amps, or the delay time adjustment on HT receiver to dial in the phase alignment. 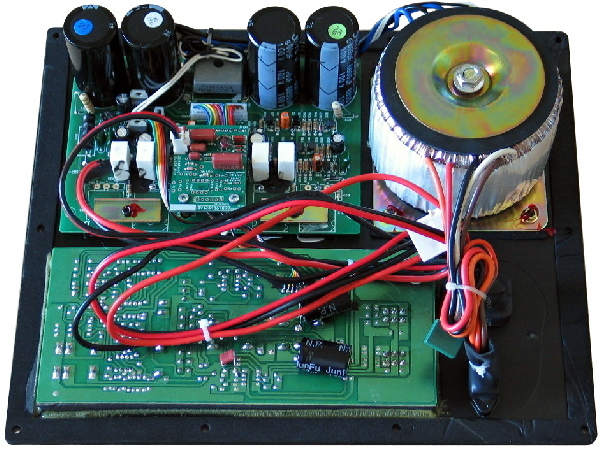 The phase control on the plate amp is only for phase lag adjustment on the subwoofer. 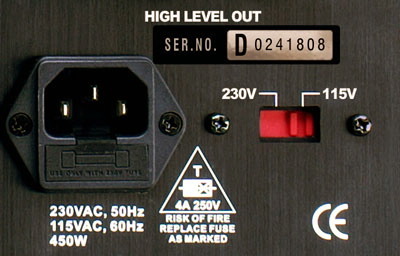 The delay time adjustment on the HT receiver can achieve both phase lead and phase lag adjustment on the subwoofer. As a general rule of thumb*, the sound wavelength of 50 Hz is 20ft. A full wave is 360 degrees. Therefore, if we put the physical distance in the delay time adjustment menu 5 ft further (or closer) than the physical distance is, the HT receiver will put a 90 degrees phase lead (lag). All of our subwoofers feature unique bass extension controls, shown below. Very low bass can cause very large cone excursions without contributing useful output. The result is that the output is limited by the large excursions required at very low frequencies. The bass extension filter increases output by reducing unwanted signal. For maximum output, the 28 Hz setting should be used with high damping. For sealed subwoofers, the default configuration is the 14 Hz setting with low damping. For home theatre use, a higher setting for both switches may be used. For vented subwoofers, the default configuration is the 20 Hz setting with high damping. In individual situations, other settings may prove more suitable. Experimentation is recommended to determine best fit. Caution is recommended with the choice of settings for vented configurations. If the damping setting is set to a frequency below the tuning point of the subwoofer, cone excursion will not be effectively controlled. Low damping will also not provide sufficient excursion control. For more information on the EQ used in our subwoofers, view our EQ page. Before use, correct voltage must be selected. Voltage switch is shown below.